Sometimes, we here at Digital Trends have strong opinions. And when that time comes, we take to the internet and fight. For this debate, we’re talking all about the new Pokémon Go game from Niantic Labs that’s been sitting at the top of the app charts this week. DT Mobile Staff Writer Julian Chokkattu defends Pokémon Go against Gaming Writer Mike Epstein, who says it doesn’t have enough gameplay to be called a game. Question: Is Pokémon Go good enough to even consider it a video game? I’m not sure what Pokémon Go is, but it is not a video game! The new app from The Pokémon Company and Ingress developer Niantic is just a stupid geo-cacheing app with some social hooks and an AR camera overlay: It’s an amalgamation of app features tied together by your nostalgia for an old video game and/or cartoon. Yes, you can “catch” Pokémon, insofar as you slide your finger at them, but does that count as playing a game? Hardly. In the primary Pokémon series, catching a Pokémon means fighting it and knowing when to throw a Pokeball to catch it. In this game there’s no finesse or tactics to speak of in this game. They barely even move! Plus, once you have them, your Pokémon don’t really do anything. You can’t “release” your Pokémon in the world and play with them; you can’t fight other players you bump into on the street; you can’t do anything. Once you collect a Pokémon it’s basically a sticker with stats attached that you can pay real money to upgrade. The point of Pokémon Go isn’t to play Pokémon, it’s to let fans pretend they’re living the life of Pokémon trainer. It’s cosplay for your phone. That’s pretty cool, I guess, but without any kind of direct competition, narrative, or even a means of building a community, there’s nothing making me like an active participant. I don’t feel any different looking at the Pokémon Go map than I do looking at the Google map, except I don’t know where I’m going. This is not a game, and it’s not a good app, either! Give me a break, Mike! Merriam-Webster defines a game as an “activity engaged in for diversion or amusement,” and I can’t find a better description of Pokémon Go. It’s most definitely a game — a really popular one, too. It is so engrossing that there’s a message in it telling you to “remember to be alert at all times.” You know, so you don’t get hit by a car while trying to catch a Psyduck. Yes, Pokémon Go is riddled with bugs that should have been fixed in the beta, poor GPS makes characters drift constantly, and you can’t even battle with your Pokémon like you can in regular games. I’d like the bugs to be addressed, actual battles to be implemented, and for the love of Pikachu the servers to remain up, but I can’t stop opening Pokémon Go when I’m walking around and about, or when I’m at home. Maybe it’s just nostalgia, I don’t know. I do find joy in seeing the Pokémon I grew up battling with randomly popping up wherever I go. And I can catch them all! Sure, all I have to do is flick Pokeballs to capture them, but that doesn’t make it any less of a game. There’s a chart that mentions what Pokémon are near, and you can track them based on the number of footprints that are under them — kind of like Hot or Cold, which is, most assuredly, a game. To finish off my dictionary explanation for you, Mike, Pokémon Go is also “amusing” — seeing Pokémon appearing in our world can be hilarious, like how Magikarp can show up in your shower, on the ground, or even a frying pan. Finding Pokestops is also kind of fun, because you’re actively exploring your neighborhood and can find things you didn’t even know existed. So what makes Pokémon Go better than simply taking a walk? Do you really need your content to tell you how to enjoy your day-to-day life? IS REALITY NOT GOOD ENOUGH FOR YOU? I’m kidding … But you don’t really do anything in this “game.” It can feel like you are, sometimes, but really there are interesting things happening around you. You, the player, have nothing to do with it. It would be way cooler to have a Pokémon Snap app that let you add Pokémon to your photos, kind of like what Miitomo’s photo features do for your Mii. Then you could actually see and do all kinds of funny things with your Pokémon. You want something to do? Let’s talk about gyms. Gyms and events are a big part of Pokémon Go. Of course, we have yet to try any location-based events from Niantic Labs seeing as the game was just released, but gyms are already being controlled by members of the three teams: Red, Blue, and Yellow, also respectively known as Mystic, Valor, and Instinct. Players leave their Pokémon at these gyms, which are usually some type of a landmark, and other players in your team can help defend it by leaving their Pokémon there. Controlling a gym gives you a certain amount of XP and Pokecoins per day, which then lets you purchase more Pokeballs, Incense to attract Pokémon, Eggs, and more. You can also attack a rival gym, selecting up to six Pokémon to use. Once you’ve started battling, you can tap on your Pokémon to perform a fast attack, and swipe left or right to dodge attacks — and you can long-press your Pokémon to perform a special attack. 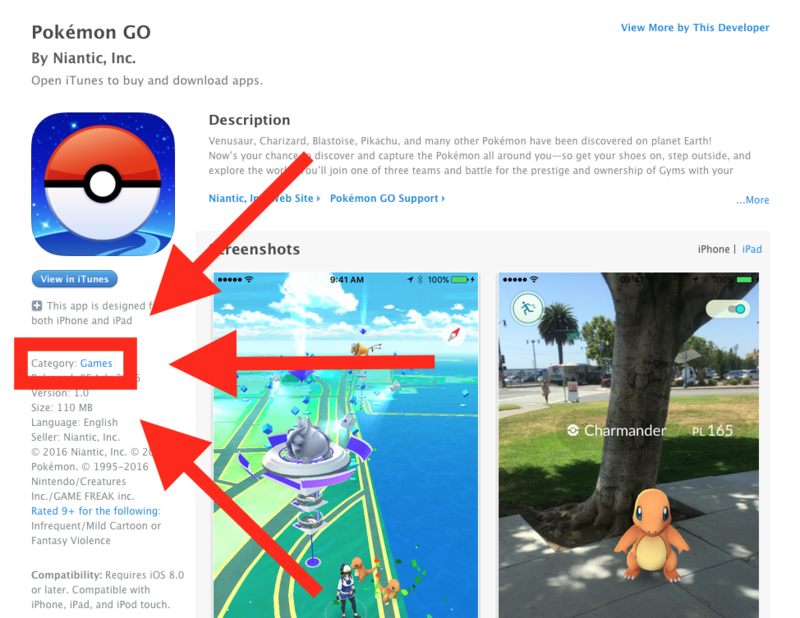 Sure, it’s simpler, but how is Niantic Labs’ implementation that much different than classic Pokémon? Gym battles are fun, and you have to continuously defend your gym and attack new ones to hold down a territory. If the gym combat were possible any time you ran into another player and/or when you tried to catch a Pokémon, that would make Pokémon Go a game. While your options are very limited — you can tap to attack and swipe to dodge your opponents — I can’t deny that you are actively engaging the app. Unfortunately, that’s just a tiny part of Pokémon Go. You spend most of your time staring at a weird facsimile of Google Maps and swiping to throw Pokeballs. As it is now, this is a weird social app with a game inside it. A game, I might add, that you have to wait hours before playing. How long will you spend in this thing before you actually “play” it? Also, I think it’s worth pointing out here that your definition of a game is exceedingly broad. I hold games to a higher standard: I expect them to make me feel … something, even if its mild and momentary: Joy. Wonder. Amusement. Sadness. Something! Yes. Games are “exceedingly broad.” A game like Pokémon Go might not be all that fun to you, but to someone like me, it can offer joy, sadness, and frustration. This may sound lame, but I cried out “nooo” last night when a CP (Combat Power) 90 Bulbasaur evaded my Pokeballs and ran away. My girlfriend said, “Oh no, I’m sorry” — and it was genuine. Do you know why, Mike? Because she had Pokémon Go open for a half hour at that point, during which she caught 15 more Pokémon. Pokémon Go is a game. It has a lot of bugs and problems, and could use a lot more features like one-to-one duels and trading, but it’s still a fun, light-hearted way to have some fun with pocket monsters — and did I mention you keep active at the same time? And, damnit, if you wanted more evidence I have it right here. Mortal Kombat 11 is a complex fighting game with several systems to learn, but with our beginner's guide and a bit of practice, you can be finishing enemies off with a Fatality in no time. Posted 20 hours ago — By Charles Singletary Jr.